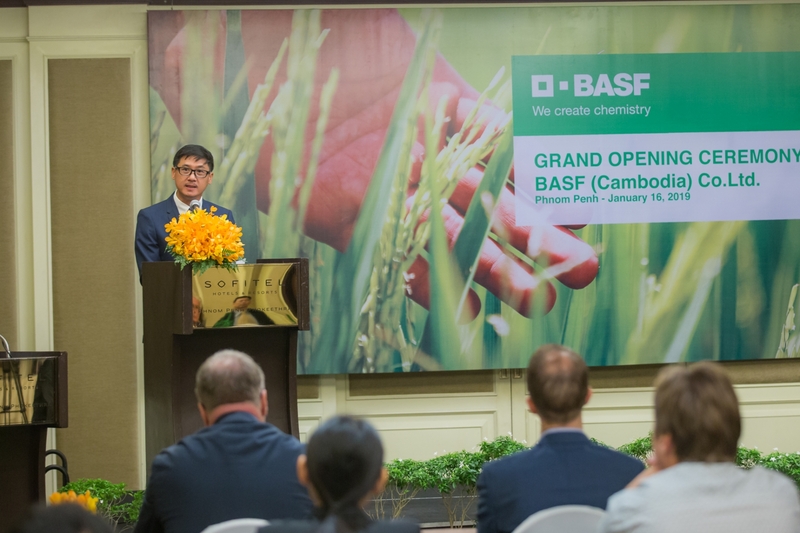 BASF, the world’s leading chemical company, has inaugurated its first wholly-owned company in Cambodia, namely BASF (Cambodia) Co. Ltd.
BASF has been active in the Cambodian market since 2014 through distribution partners. Now, the company’s direct presence in the market will offer potential Cambodian customers and stakeholders innovative solutions in a range of diverse industries. Three new crop protection products will be initially launched, empowering farmers and growers with more tools in their toolbox to manage their crops like Basagran Herbicide for broadleaf weeds and sedges in rice, Tetris Herbicide for weed grasses in rice as well as Regent 50 SC Insecticide for stemborer, thrips and leaf folder in rice. To support local farmers, BASF will maintain a team of local technical specialists in Cambodia, who will be supported by BASF’s network of experts in Southeast Asia and around the globe. Additionally, BASF aims to engage with both distribution partners and farmers directly to conduct training sessions on sustainable agricultural practices; including proper selection and safe storage, application and disposal of crop protection products. BASF will also offer solutions from its Performance Materials division. These include solutions primarily in footwear and furniture manufacturing. For more than forty years, BASF has been developing, producing, and selling the tailor-made footwear materials Elastopan® and Elastollan® for all types of shoes and soles. With its portfolio of polyurethane systems, thermoplastic polyurethane elastomers and engineering thermoplastics, BASF offers leading companies in the footwear industry a unique and integrated toolbox of solutions. The Performance Materials division also provides a portfolio of applications for the automotive industry, consumer goods, construction, and industrial products across Asia Pacific. Additionally, BASF’s Nutrition & Health division is providing high-quality solutions and products to the food and beverages industry and to the animal feed industry in Cambodia, supporting the growth of the market.